Across 12 nations, 5 continents and countless manual pads and skateparks, all lines lead to New York City where the Red Bull Manny Mania World Final and Pro contest will return to Coleman Park on August 18-19. The amateurs compete against their country mates, with the cream of the crop earning a ticket to New York City. 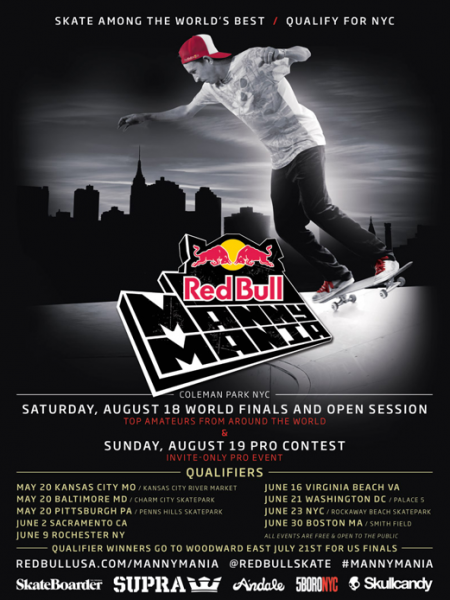 In the U.S. nine regional qualifiers will be held from Boston to Sacramento, sending the best to Camp Woodward in Pennsylvania on July 21 to compete in the National Final to represent the U.S. Only one will move on in the Red Bull Manny Mania World Final in August, carrying the hopes of the U.S. on the back of their board. The series will culminate in two marquee events, the Red Bull Manny Mania World Final and the Red Bull Manny Mania Pro, taking place August 18-19 in New York City. The winner of the World Final will quickly step into the big leagues, earning a spot to compete against the pros the next day. If you think this newbie will have no chance against skateboarding's elite, think again: last year's Am champ Sewa Kroetkov from The Netherlands came in 2nd overall in the Pro, shocking and delighting the crowd with his unbelievable skill level. Entering into its 6th year, the invite-only pro event has brought some of the best skaters to New York City, including past winners Brezinski, Ronnie Creager and Eli Reed as well as other top skaters such as Dennis Busenitz, David Gonzalez and Eric Koston among many others.